The National Research Act of 1974 set the stage for several important systems of checks and balances in clinical research. It led to the creation of the National Commission for the Protection of Human Subjects of Biomedical and Behavioral Research, as well as the Belmont Report and Institutional Review Boards (IRBs). Here's a closer look at this important milestone in the history of clinical research. With the resignation of FDA Commissioner Scott Gottlieb taking effect this month, many clinical research professionals are wondering how this could impact their drug and device trials. During his tenure of just under two years, Dr. Gottlieb introduced a number of initiatives, including one aimed at aggressively regulating teenage vaping, reducing nicotine in cigarettes to non-addictive levels and banning menthol in cigarettes. He also oversaw the approval of a record number of new medicines, generic drugs and medical devices. Yet his departure leaves many questions unanswered, especially those that impact the medical device industry. ood Clinical Practice (GCP) is a foundation for all clinical research, driven by a desire to ensure everyone who participates in studies is given the protection they deserve. The fundamental principles of GCP have not changed since they were introduced more than 50 years ago. However, as the use of technology in clinical research has evolved to include electronic signatures, records and more, there are new considerations. When it comes to ensuring compliance, keeping your trial on track and bringing your medicaldevice to market faster, having independent oversight from a strategic partner makes all the difference. What Are Your Monitoring Pain Points? We have had many conversations with sponsors regarding their needs for monitoring support services. It is clear that while many sponsors consider the outsourcing of their monitoring needs to a CRO, they have many concerns that they have shared with us. While procedures, checklists, guidance documents, report templates and all sorts of other things combine to form the infrastructure for monitoring, what is possibly even more important is the shared mindset. The acceptance by all that regardless of the title, there is a shared responsibility in calling out issues, in looking purposefully at this document, in questioning that blank. What happens if you have a site that requests to use an unapproved device that could be life-saving for a patient without an Investigational Device Exemption (IDE)? The device has been through the phases of clinical trials and the Sponsor is working on submitting the premarket approval (PMA). The site in question was part of that clinical trial but now the study and enrollment goal has been met and the both the site and study are closed. Outsourcing clinical support services is a common practice, but can be a challenging process. Over the years, we have had many conversations with sponsors regarding their need for clinical support services and they have shared many of the challenges they have faced. 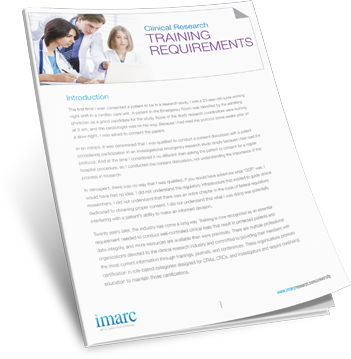 IMARC’s FAIR Shake ™ technique takes a complicated maze of regulations and breaks them down into four simple areas your team can apply to clinical research questions. Using this technique will give you confidence in resolving potential compliance issues and bridge the gap between knowledge and application. There’s a reason our FAIR Shake guide is one of our most-requested resources. Can (Should?) a Data Safety Monitoring Board and Clinical Events Committee be Combined? Clinical Trials Day 2017: Celebrating Research Participants and Professionals Worldwide! Clinical Trials Day is celebrated around the world on or near May 20th each year in order to commemorate the day that a Scottish naval surgeon, James Lind, conducted what is often considered the first randomized clinical trial aboard a ship on May 20th, 1747. This year, Clinical Trials Day will be celebrated on Friday, May 19, 2017. In 1747, surgeon mate James Lind administered six different methods to attempt to heal sailors that were diagnosed with scurvy, with one of the methods involving oranges and lemons. This method healed the sailors, becoming a breakthrough for an intervention of scurvy, but more importantly demonstrating the potential power of a clinical trial. The key players in a clinical investigation are infamously made up of Sponsors, monitors, investigative sites, and patients. A fundamental part of the team is also the Institutional Review Board (IRB), as they oversee the conduct of clinical research. Per the FDA’s IRB information sheet, “IRBs are responsible for continuing review of ongoing research to ensure that the rights and welfare of human subjects are protected.” That’s a tall order! This whitepaper examines the similarities and differences between various US and international regulations and place them within the context of any number of roles found within the realm of clinical research.